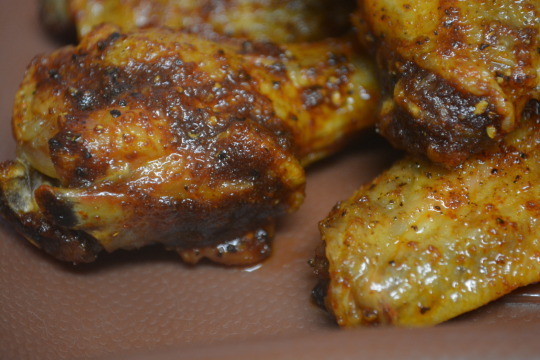 Near the end of the cook time on the chicken wings, take a small saucepan out and mix the following ingredients together in it over medium heat: melted butter, ground red pepper, dark brown sugar, ½ tsp. kosher salt, smoked paprika and garlic powder. Stir those ingredients together for 1 minute or until fragrant, taking the saucepan off the heat and stir in the apple cider vinegar afterwards. 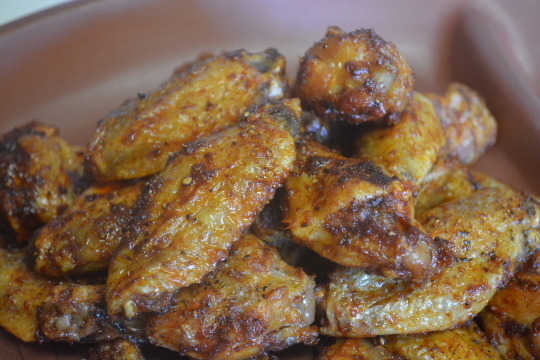 Place the chicken wings in a large mixing bowl, pouring the sauce over them afterwards and tossing to coat. Serve immediately. These were delicious ! It started off with a little bit of sweetness and then the heat came in. There was definitely a spiciness that kept you coming back for more ! While I did enjoy the level of heat, I can’t wait to make this again with an additional teaspoon of ground red pepper just to see what it tastes like then ! The sauce recipe came from Southern Living.